Artist and master paintmaker Art Graham put years of experience at other companies behind him and started his own business based on his own vision and values. The result is a paint, manufactured without fillers or additives, that goes back to some of oil painting's finest traditions. 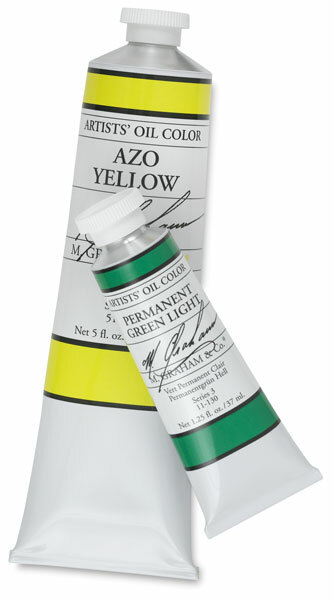 M. Graham Artists' Oil Colors are made with a walnut oil binder, an alternative to traditional linseed oil that's been preferred by artists for centuries. In fact, today it's known that Renaissance masters such as Da Vinci and Durer generally favored walnut oil over linseed oil. Walnut oil provides rich, vibrant color that is naturally more alive and brilliant than traditional linseed oil. Free flowing and slow drying, M. Graham's walnut oil formulation enables delicate passages of finely blended color that retain their brilliance over time. 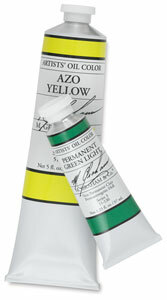 Set of 5 Colors with Free Mediums — Contains five, 1.25 oz tubes of M. Graham Solvent Free Oils including Azo Yellow, Napthol Red, Ultramarine Blue, Phthalocyanine Green and Titanium White. Also includes FREE 2 oz bottle of Walnut Oil and Walnut Alkyd Medium (a non-toxic, environmentally responsible alternative to solvent).